Myer has put out a call for suppliers to participate in its new Myer Market after launching a beta of the online marketplace this week. The Myer Market is an online marketplace promising Australian shoppers a curated range of higher-end local and international brands not previously seen on Myer shelves. First detailed in the department store giant’s November strategy update, the intention is to offer up a diverse range of categories through numerous sellers, and provide consumers with access to products not traditionally available through traditional Myer channels. The site has been developed in partnership with Australian company, Marketplacer, which delivers marketplaces across nine countries and 3000 sellers, including the Bike Exchange. 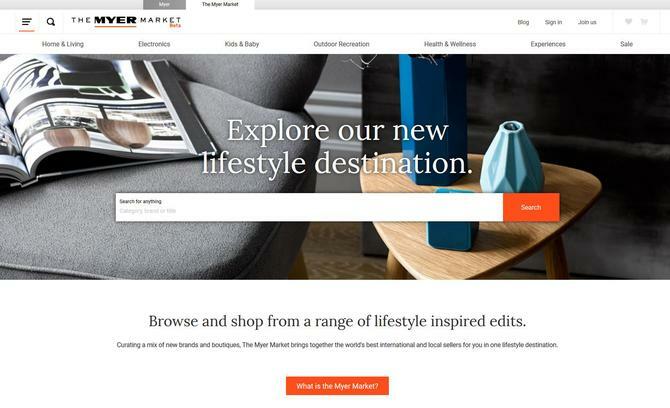 The Myer Market’s debut comes as Amazon’s launch in Australia looms imminent and is the ASX-listed company’s answer to the US behemoth’s marketplace approach. It also comes as the embattled retailer continues to try and revitalise its brand and build out omni-channel capabilities in the face of ever-tougher trading conditions for local retailers. Myer softly launched the beta portal this week, as well as a dedicated form for potential partners to register their interest, and said it’s looking to evolve and refine based on customer and supplier feedback. Sellers pay a monthly membership fee plus a commission to Myer on all sales. Brands featured initially include redballoon, Lekker, Fitbit and Plyroom. Products are also showcased under more traditional product categories as well as areas of interest such as discovery, kitchen and dining, and sports and outdoors. The Myer Market will operate as a subdomain alongside the myer.com.au portal. “Some of the world’s fastest growing companies are marketplaces; selling products and services without owning the asset,” Myer chief digital and data officer, Mark Cripsey, said. Sellers are required to ship their own goods directly to consumers, however, the department store giant said its ‘no regrets policy’ will allow consumers to return an item via post or drop it off at physical stories. To help incentivise consumers, Myer will offer two shopping credit to Myer one members for every $1 spent in the marketplace. It’s also offering gold or platinum customer loyalty program members free standard delivery nationally and said suppliers are expected to deliver within seven business days. In cases where Myer is the direct seller, the retailer offers a standard delivery window of 4-7 business days across the country with the exception of some regional areas. “Australians don’t buy things, they buy the memories and moments that those things will bring. And so, by layering emotion into the shopping process and giving people ideas and inspiration via onsite content, The Myer Market creates both an on-site and off-site ecosystem that keeps people coming back and draws people in,” the website stated. The site also provides a lucrative means to derive incremental revenue and customer data, the retailer said in its strategy update in November. Melbourne tableware brand, Made in Japan, is one of the sellers signed up to The Myer Market. Its representative, Jack McDonald, said being asked to be part of the marketplace was a good opportunity.